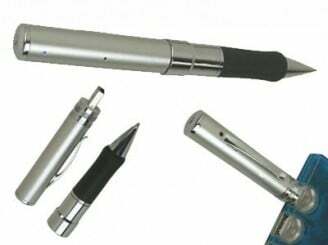 Check out this James Bond style video recorder disguised as a pen just released by Vavolo. The pen has a 1/3 inch CMOS camera that captures AVI video in 360 x 280 resolution and stores it on the built-in 2Gb flash memory. While it can record for more than six hours, the built-in rechargeable Li-ion battery limits recording to three hours per session, which is still likely to be more than adequate in most circumstances. When youve done your covert recording, you screw apart the pen, plug it into the USB port on your computer and it can be played back on the computer. Its entirely Plug-and-Play in any recent Windows environment (XP\2000\ME\98SE) with no set up necessary, and the high fidelity microphone can capture audio from around 2-3 metres, ensuring youll get clear audio over a table or in near proximity to your target. The 20 gram pen is 14mm in diameter at its widest point and 145 mm long, and to writes just like a normal pen, and takes standard cartridge refills.